VoiceBunny is a service that allows you to get professional voiceovers for your “how-it-works” or explainer videos, games, tutorials, etc. You give VoiceBunny a voiceover script and they will get professional voice actors to create the audio file. At Kera, our product allows people to create and deploy in-app tutorials for their web application. Sometimes the people making tutorials aren’t comfortable with using their own voice or it doesn’t reflect the brand appropriately - this creates a lot of problems for our users. So we decided to make it easier for our users to get access to professional voices and contacted VoiceBunny. They told us about their new program for integration: co-branded sites. Guess what? 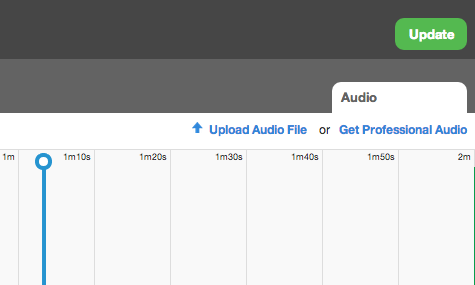 Now we have a button on our tutorial editor which helps users get started with creating professional audio. On Kera you can upload your own audio or get professional audio using VoiceBunny. This is what we use right now. There’s no work required from us. Contact VoiceBunny and tell them you want to have a co-branded site. They will build a branded version of VoiceBunny for you and give you the link. Simply link to that page from your site. It looks like this, VoiceBunny and Kera Co-Branded Site. The benefit is it doesn’t require any development time from you and you get a small commission from the project. The downside is your users need to sign up for VoiceBunny and must leave your application to get professional audio. We’d like to do this but it’s not a top priority at the moment so we went with the co-branded site. If we used their API, we would be able to have the user post voice projects directly within our application and we would handle charging the user (or bundle it in our monthly fee). Vungle - helps mobile application developers promote and monetize their apps through in-app video trailers. Spreaker - allows anyone to create, broadcast and share a personal live podcast online. We’re really thankful for VoiceBunny’s service as it makes it a lot easier for our users. If you’re one of our users and would like some tips on how to create a great VoiceBunny project, read this article. And if you’re a company looking to see how to work with VoiceBunny, see their partnership page.